As a new TransformSC school, Darlington High School is excited about the partnerships and opportunities available by being a part of the TransformSC network. Our team attended last week’s Blended Learning Institute in Columbia and had the opportunity to work with and learn from national experts and local educators who have been using blended learning methods in their classrooms. Even though we’ve been using blended learning practices in our classrooms for a few years now, there’s still so much to learn and it was good to hear the experiences and solutions other educators shared. While discussing stakeholders and how to get them to buy-in to blended learning, we listened to other schools talk about the methods they used for educating and informing their boards of education, parents, community members and other key stakeholders. This conversation has inspired us to start our own “Parent University” at Darlington High School, where we will educate parents and show them what their kids are doing on a daily basis with blended learning, PBL and technology. There were two presenters that I particularly connected with: Lori Vinson and Catlin Tucker. Since the institute last week, we have shared ideas and resources via Twitter. In her session “Got Resource,” Lori shared a wealth of technology resources with the group and inspired us to start a project we’re calling “#DHSTechU.” Our DHS Innovation Specialist and Technology Specialist are collecting and categorizing tech tools on a website where teachers can easily find resources similar to Lori’s Blended Space, which she shared with us at the Institute. Catlin’s session covered a lot of tech tips and ideas, but the one that stuck with me was her discussion on rotation stations. It hit home because we have been trying to get teachers to change classrooms from the stand and deliver old-school-style to more of a rotation station concept. I have since shared many of her ideas on Twitter with my faculty and we look forward to using some of these concepts and methods to enhance our own classrooms. We were inspired by the stories our colleagues shared at this blended learning institute. We look forward to sharing our own stories and solutions as we progress through our transformation and to attending the next institute! Interested in joining TransformSC for our final Institute of the year? Sign up for our Project-Based Learning Institute on Jan. 24! 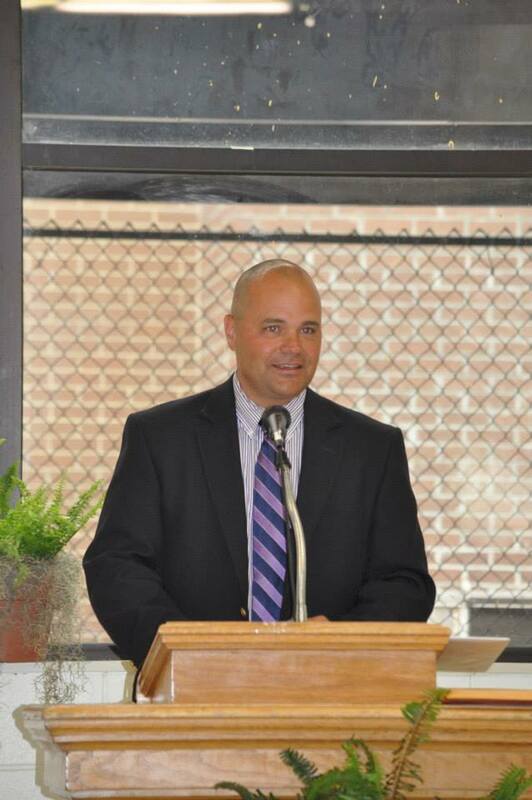 G reg Harrison has served as the principal of Darlington High School (DHS) for the past seven years. Under his leadership, DHS has consistently made yearly gains in student academic performance, has been recognized by the State Department of Education with yearly Palmetto Gold Awards, and has been recognized by the U.S. News and World Report for the past two years. The Greater Darlington Chamber of Commerce named Dr. Harrison Educator of the Year in 2014. This past school year, for the first time in school history, DHS had seven students graduate with their Associates of Arts Degree as part of the Early College Honors Program. Hundreds of other students earned over a thousand college credit hours. Darlington High School shifted its educational focus to 21st Century skills this past school year, and has implemented several 21st Century initiatives this school year that focus on communication, collaboration, creativity, and critical thinking skills.